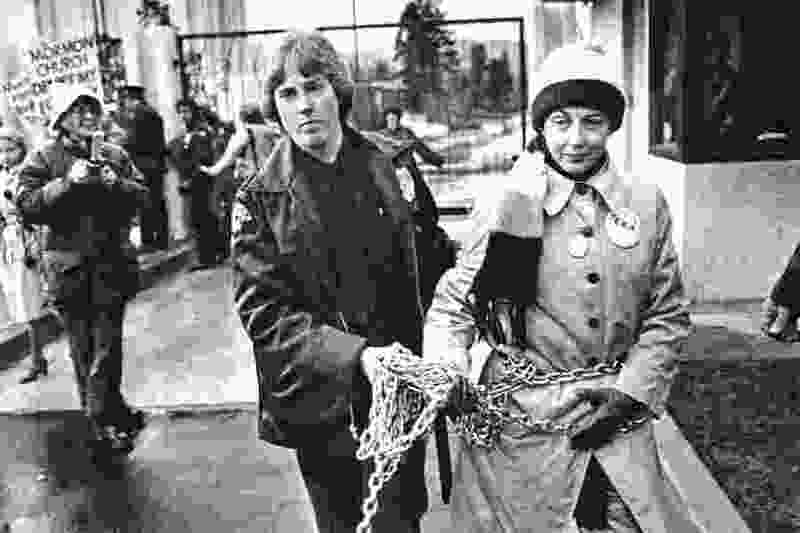 (AP file photo) Sonia Johnson is led away from an LDS temple by a police officer after she had chained herself to the gate during a pro-Equal Rights Amendment demonstration in Bellevue, Washington on Nov. 17, 1980. Johnson was excommunicated from The Church of Jesus Christ of Latter-day Saints after publicly speaking in favor of the ERA. Sonia Johnson, who gained national fame as a fiery supporter of the Equal Rights Amendment in the 1970s and ’80s, credits the LDS Church — with a hint of sarcasm — for making her a feminist. Church leaders in Virginia excommunicated Johnson from the Utah-based faith in 1979 for spreading false doctrine and working against both the teachings of The Church of Jesus Christ of Latter-day Saints and its leaders. She maintained it was for exposing details of the church’s national campaign against the proposed constitutional amendment. Rather than quell her desire to fight for women’s rights, the discipline revealed to her the male hierarchy’s grip on power and catapulted her even further into the movement. Johnson, now 82 and living in Tucson, Ariz., grew up in Logan as a believing Latter-day Saint, married in a temple and had four children. But Johnson’s ERA advocacy created tensions with the only church she had ever known, and that, in turn, prompted her to evaluate all aspects of Mormonism. It also ended her marriage. Then she went from being tossed out of the church to chaining herself to the faith’s temple gates in suburban Seattle. She did the same outside the White House and blocked the entrance to Republican national headquarters. Probably Johnson’s most visible challenge on behalf of the ERA was a 37-day hunger strike in the Illinois Capitol. When the ERA failed to win ratification by three-fourths of the state legislatures by the deadline in 1982, the iconic feminist ran for president two years later on the Citizens Party ticket. After that effort fell short, Johnson continued to write and give speeches but soon retired from politics and faded from public view. Latter-day Saint feminists watching Johnson’s spiritual trajectory began to assess their own paths and decisions, said historian Kathleen Flake, who teaches Mormon studies at the University of Virginia in Charlottesville. (Tribune file photo) Sonia Johnson in 1980. 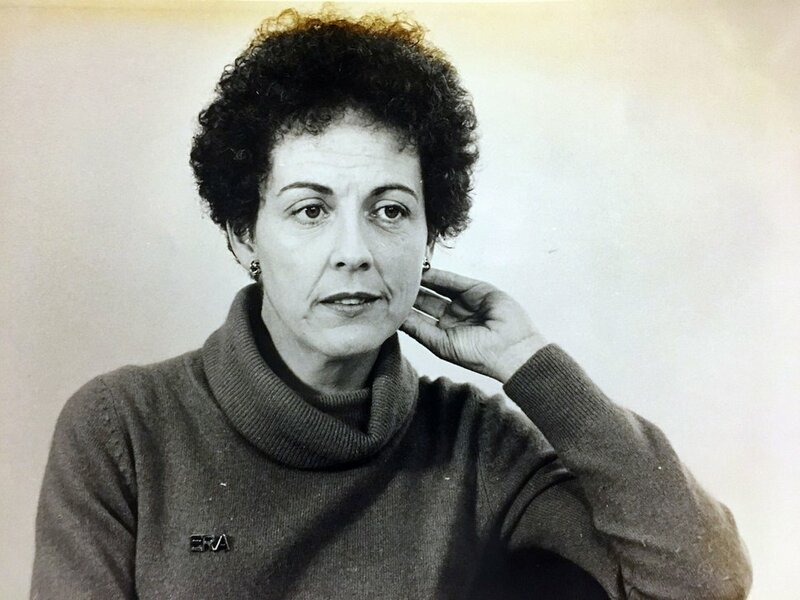 Back in 1982, just weeks before the voting period on the ERA would close, Johnson and six other women camped out in the Illinois Statehouse Rotunda every day from 10 to 2 — drinking only water for the duration. The amendment had been ratified by 35 of the 38 states needed for passage. Illinois was one of the last holdouts. When Johnson pitched the hunger strike idea, Nicholson initially gulped, then agreed. 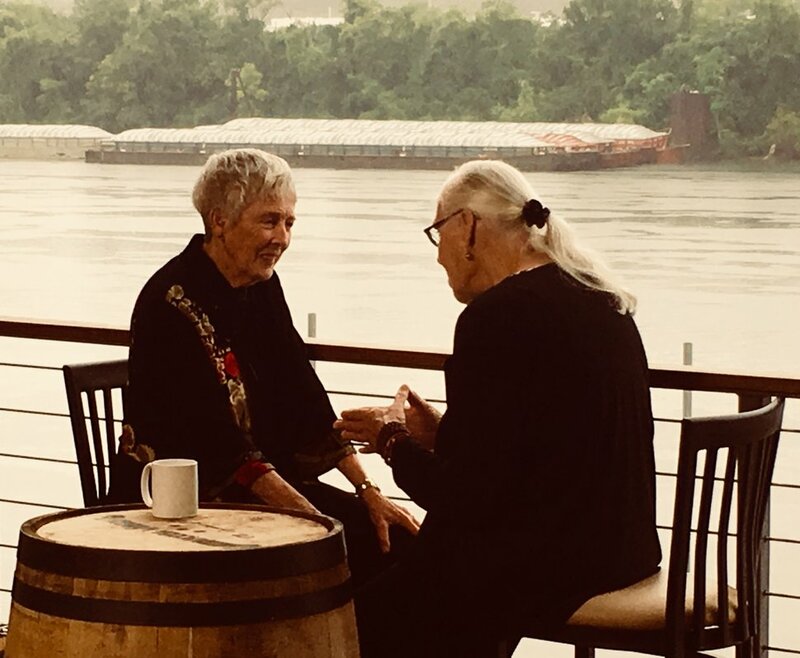 It was the first time in Nicholson’s life, she told former “Today Show” host Ann Curry on a recent episode of the PBS show “We’ll Meet Again,” that she had the courage to die for a cause. And Johnson was the one who challenged her to do it. A banner above the women, dressed in white like the early suffragists, read: “Women Hunger for Justice.” They lost weight (Johnson went from 122 pounds to 99; Nicholson dropped 32 pounds) and suffered major health problems. The petite ex-Mormon was hospitalized three times and had to use a wheelchair, while her protege temporarily lost her eyesight. Their fast ended after 37 days, when the ERA fizzled. But Johnson was proud of the message their stance sent: Look what we were willing to give for our country. (Photo courtesy of Blink Films) Sonia Johnson, left, reunited with her feminist friend Zoe Nicholson in the PBS show "We'll Meet Again." Politics had disappointed her, Johnson concluded, and a backlash set in against women. Some universities shut down their women’s studies programs, she said, and other hard-won battles for equal rights were reversed. To her, the women’s movement was dead. Speaking gigs dried up, and she wasn’t sure what to do next. So she gathered some like-minded women around her and established a feminist outpost in New Mexico. The women bought an old monastery in the mountains near Albuquerque but soon ran into a serious obstacle: the weather. Little by little, the women dropped out, leaving only Johnson and Jade DeForest, who began a lifelong relationship. The two sold that place and moved several times, eventually landing in Arizona, where they have been together now for 28 years. They are best friends, soul sisters and marriage partners, Johnson said, but not lovers. The feminist firebrand, who cut off all communication with her children more than two decades ago, wrote a handful of books, the last one — “The SisterWitch Conspiracy” — in 2010. Now, she is paid to sit with an Alzheimer’s patient, a job she relishes. And she is delighted to see a resurgence of energy around issues like #MeToo. A new women’s movement has been born, with marches set for Saturday across the nation, including in Salt Lake City. Johnson joined the 2017 women’s march in Tucson, walking alongside hundreds of young feminists and amazed at the openness of their conversations about their bodies, sexuality and male dominance. Last May, in the same building where Johnson and Nicholson fasted, Illinois lawmakers voted to ratify the ERA. In the PBS documentary, Nicholson crisscrossed the country seeking the mentor who had inspired her. In the finale, the pair had a teary reunion at Johnson’s Arizona home. Johnson feels good about what she has done with her life.